It is not uncommon for a patient to give a history of being 'allergic' to an antimicrobial – usually penicillin – and this can present a dilemma. If an antimicrobial is administered to a sensitised patient, serious reactions such as fatal anaphylaxis or Stevens-Johnson syndrome can occur. However, many patients who report a penicillin allergy have a vague history and are not allergic at all. Also, it is important not to deny patients treatment with an antimicrobial unnecessarily, especially if they have a serious infection for which that antimicrobial would be the most effective treatment. Contact the Infectious Diseases unit or clinical microbiology for appropriate advice regarding alternative antimicrobial selection or potential desensitisation therapy. Desensitisation is an involved process and requires consultation with the immunology team and the infectious diseases team, including the ID pharmacist. Patients with hypersensitivity to penicillin are more likely also to be hypersensitive to other structurally related drugs. However, the exact prevalence and importance of crossreactivity is not known. Use significant caution when considering β-lactam antimicrobials such as penicillins, cephalosporins, carbapenems and monobactams for patients with severe hypersensitivity reactions to any one of these classes. 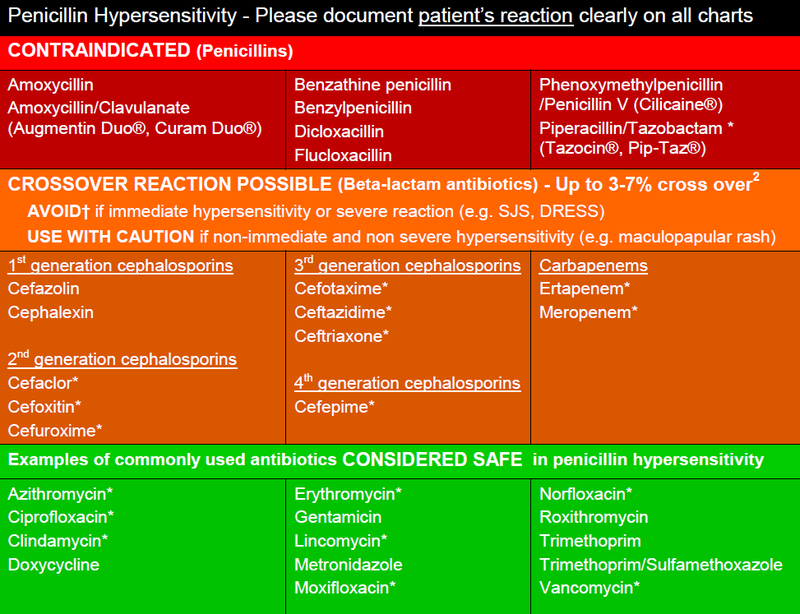 It is also important to be aware of potential hypersensitivity reactions within classes of other antimicrobials (e.g. macrolides or quinolones etc). NB. The above lists of antibiotics are not exhaustive. Please contact your pharmacist if you require further advice. Please contact Infectious Diseases to discuss alternative antimicrobial options if required. * Restrictions apply to these antibiotics. Please refer to Metro South Antimicrobial Restrictions. 1. Medication Services Queensland. Empirical IV to Oral recommendations for ADULT patients. 2012. Queensland Health.